If you’ve read my book Lost Seattle or browsed through this site, you know I’ve got a thing for the lost and the forgotten. So when a friend emailed asking me to find evidence of a defunct mosquito fleet port, I was all in. My task: prove that Gilberton, WA was different from Brownsville, WA. The mosquito fleet was a swarm of small steamers carrying passengers, mail, and parcel freight between ports on Washington’s Puget Sound, its bays and up navigable rivers. They even connected up into British Columbia. The first at Seattle was the Fairy which began service in 1853 when Seattle’s settlement was just a couple of years old. In my book I chose the 1936 fire on the Verona which was left to burn at its dock as the end of the small, old fleet. 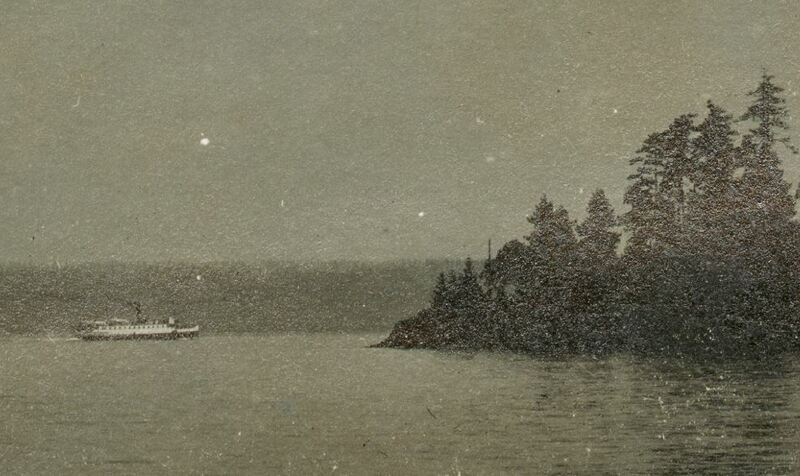 The Steamer Potlatch seen near Brinnon in about 1914. Taken by my relative Byron Bird. Larger on Flickr. The unincorporated community of Brownsville, located in Kitsap County, first saw some scattered non-Native settlement in the 1860s, but real growth — mostly of Scandinavian immigrants and their descendants — did not arrive until the 1880s. When a post office was established in January 1890, it was named Brownsville after Solomon Brown, who was probably the first white settler to homestead in the area. By the early 1890s there was a small floating dock servicing Brownsville (a more permanent dock was built in 1901), and regular daily landings of steamers began in 1892 when the steamer Delta began delivering mail from Seattle. 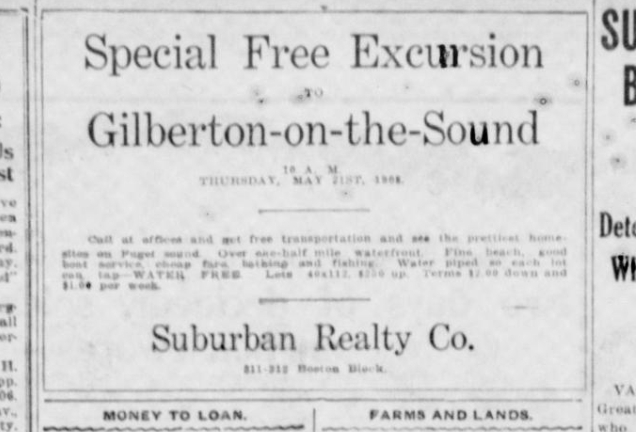 Advertisement from the Seattle Star for May 21, 1908 trip to see beachfront lots at Gilberton. Mosquito fleet service to Gilberton was offered from Seattle by the Kitsap County Transportation Company, initially from Pier 3 and then in October 1910 from Pier 4. Additional service connected the community with nearby Bremerton. In 1917 the Grahn family purchased the steamer Tazlina and its service between Brownsville and Bremerton, including Gilberton and the family property Grahn Kove. The Grahn steamer history can be read on the Great Peninsula Conservancy website. 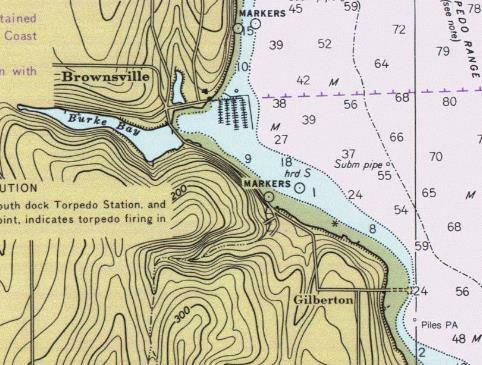 NOAA map section showing Brownsville and Gilberton. Gilberton pier remains jut out to the east at the bottom right of the map. NOAA 6446-07-1948. The NOAA map was the evidence I was looking for to show that Gilberton was a separate community with its own dock. Other good histories have been written of Gilberton, such as this 2012 Kitsap Sun article. Along the way many facts have been muddled, though. Examples of common mistakes in articles I’ve linked to include the plat date of Gilberton (always referred to as 1909, but is actually 1908) and names of ferries owned by the Grahn famly (should be Chickaree and Tazlina). We’re all in agreement, though, that Gilberton was nearly forgotten — if you’ve read this far you’ve done your part to stave that off for another decade at least. None of my normal sources turned up documentation on the Gulbranson / Gilbert family, which is strange to me. The Washington State Archives or at least Ancestry.com usually provide basic facts. I’d love to validate the story about the family name change and dates of first settlement (I picked it up from Maritime Place Names, which has a reference from Washington State Place Names). Also I’d like to know the names of their children. It also took some digging to confirm that the Kitsap County Transportation Company ran steamer service from Seattle. If they operated boats on fixed runs, I’d like to know which steamers stopped at Gilberton. Drop me a line if you have anything to share on these or related topics! Robert! What a fun history of my childhood neighborhood! In the 1980s, my brother, Carl, delivered newspapers to the Grahns’ house, just ashore of Gilberton Landing at the bottom of Grahns Lane, the road seen on your NOAA map that runs between the dock and the west-south turning corner of Illahee Rd. I hadn’t heard about the Mosquito Fleet Trail Master Plan before. It amused me to read the proposal included Gilberton Landing as a point of interest. Grahns Lane is quite steep. I’m sure travellers would feel quite put out to be directed off Illahee Road down to the dead end at the bottom of Grahns Lane to see that the landing no longer exists. –The steepness of this slope is no doubt why Gilberton Landing faded away while Brownsville Landing, with its much easier access gradient, evolved into a marina. Thank you for awarness of the 2012 Kitsap Sun article! By luck, I was at the event it is reporting. I happened to be visiting my parents the very day of the Brownsville Methodist Church 60th anniversary so I stopped in. I even talked with Hildegard Stone, who was quoted in the article. She is the mother of my classmate, Mike Stone. I spotted one minor detail the article got wrong. The church wasn’t floated to a dock in Brownsville. It was brought to the beach in front of my parents’ house and rolled up across the property where their house now sits. Thanks Scott! And thanks for the fun questions. Robert: Enjoyed your article about Gilberton, Wn. and its history. I am a collector of Washington State milk bottles and milk caps,in doing so I have learned alot about history of Washington State. (Much to the surprise of my Washington State history teacher 🙂 ) I recently got a milk cap from Gilberton, Wn. “Parson`s Dairy”. Not knowing where Gilberton, Wn. was I came across your article. Nice article! Thank you too both you and Scott Ryan for the quick journey in time!! I would love to have a photo of that milk bottle, I run the facebook group, puget sound history. Thank you. Thors daughter married Oscar Parsons. Check out my facebook page, Puget Sound History. We currently live on Washington Ave (or street) NE. Our property encompasses the old torpedo markers that you see in the water just a few houses south of the old Gilberton pier. I’m not sure if you’re aware, but the natural spring the residents used to use for fresh water sits just to the right of our property down on the beach. We still have an old cart down below once used to haul water up to the top from the spring. Most of our embankment behind our walls is also flat, so I’m wondering if it is an old road. Our property is also encompasses the last of the old creosote break wall. If you would like some information on Gilberton and the Gilbert family, I might be able to fill in some of the details. Pamela Gilbert, daughter of Thomas Robert Gilbert (Bob) and great granddaughter of Thor. Sure Pamela, do you have any documents and photos to share that I could use to capture the basic story? You can find my email at the top right of the page. Hi Pam. Its Gideon Oakland, Bridget Hayes’s son, Ada Marie Gilberts grandson. We should get together and catch up. Wow, ive lost contact with Pam, Thor was my great great grandfather (named my son after him) I have some old photos but the majority of then my mother donated to a historic society decades ago. Would be fun to connect and share some of what i know or kinda of remember. i would like to know what historical society, Kitsap? This is so interesting, I hope you connect again with Pam Gideon. Thanks, we got together for coffee and family history time recently, good to reconnect. We live on Utah street in a house that was said to be a summer cabin for a Catholic Girls retreat or something. It was built in 1908 and is locally now know as the “Old John Colby” property. I can’t find any reference to it’s existence as a girls vacation cabin but would love to know the history. In 1940, my parents, George and Helen Pearson, built the house currently owned by the Petter family. It was next door to John and Ida and Jackie Bleck’s home. Dad bought the community water system in the 1940’s using the water from the springs on our beach. The cart to which Erick refers was used to haul the electric pump motor up the steep steps from the beach. In the winter that motor was used to cut wood to heat our house. In the winter there was enough water from uphill springs to keep the reservoir, just east of Sandy Rd., filled. The Gilberton Water System was gravity fed. Later the Pearson’s owned and operated the Gilberton Grocery at the corner of Illahee Rd. and Washington. The community of Gilberton is still listed on state and county maps. The current Brownsville School and Brownsville United Methodists church are both located within the plat of Gilberton. My brother, Robert, and I can still identify early homes and the families who lived in Gilberton. We have a copies of two original deeds dated in 1907 filed in the 1800’s to Thor Gulbranson under the authority of President Cleveland. Our family has owned property in Gilberton since 1940.